After delivering patient-centered dentistry for more than 40 years, I can honestly say now is the best time to be a dentist. Incredible advancements in technology and techniques mean a wider, stronger range of care options. I’m pleased to now offer our patients dental procedures utilizing the Solea Dental Laser. Solea is revolutionizing the dental experience: it’s painless, eliminating the need for injected Novocain. It works on both hard and soft tissue, so I can use it with a variety of procedures. It’s virtually silent in contrast with common dental drills. And there is little to no bleeding when I use it. Patients are able to have extensive restorative care without stress or discomfort! My profession is my life: everything I do revolves around being a dentist. My team and I are dedicated to providing the best environment and care for our patients. We’re always on our game and striving to constantly better ourselves. I am honored to have served our country as a Captain in the United States Air Force Dental Corps. 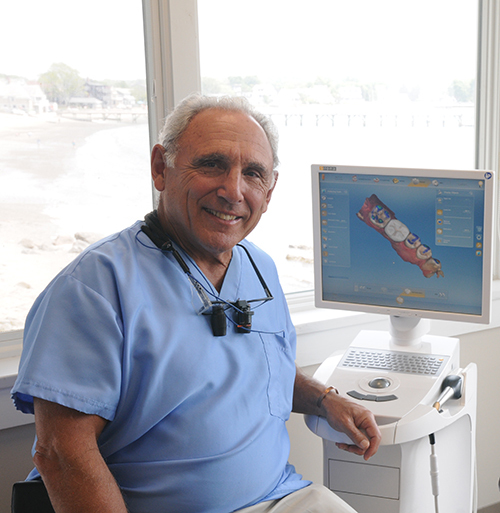 Following my service, I moved into private practice here in Swampscott. From 1973 to 1983, I served as a faculty lecturer and teacher at Test University School of Dentistry. I am also a national lecturer on preventive techniques, bonding, capping, periodontal aspects of restoring teeth, and practice management. I am committed to remaining current on developments in dentistry. The technologies being explored and implemented are constantly improving the care we offer. I must remain at the leading-edge of these changes; pursuing continuing education ensures I exceed my patients’ expectations for pain-free visits and the most incredible results. I am an Atlantic City, NJ native who has called the Marblehead and Swampscott area home for more than 45 years. I have three amazing daughters, three grandchildren with a fourth on the way, and a dog named Lucky. When I’m not in the office or fulfilling my other responsibilities, I enjoy playing tennis, golfing, and biking. I love the beach and the ocean, with fishing and boating being my favorite pastimes. I also do a lot of reading. I’m passionate about life and being the best person I can be.